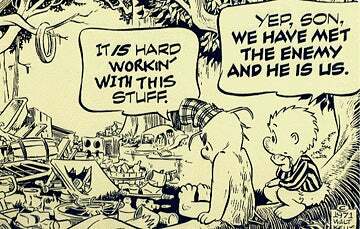 At a thrift shop I bought two good size books on Walt Kelly’s Pogo. I believe a totally extinct comic strip, popular from late 40s to early 70s. Perusing the book I am amazed how political it was one was a politician with one voter and the politican wanted a poll done. They were all animals. Pogo was a possom. Best of Pogo starts off with an early storyline about Pogo babysitting a worm for its mother. Albert Alligator, yes an alligator, suggested the worm should be used for bait for fishing. Pogo disagreed. Makes me wonder if that could be written today since it comes across as child abuse although in late 40s were readers thinking that or “worms are bait for fish”. One thing I believed most of my life was the quote “we have met the enemy and he is us”. I always thought it was about Vietnam nope about pollution. The quote holds true today.